Perhaps during the colder weather you’ve curated a jungle of house plants in your living room and neglected your actually outdoor garden space. 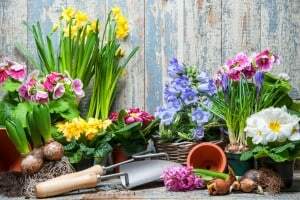 Or maybe you’ve just been itching to get outside since the colder weather started to dissipate – either way here are six ways to brighten up your garden this spring ready for the summer months of lazy BBQs and deck chairs. With spring comes a multitude of new and exciting bulbs to feature in your garden. Daffodils are a must when it comes to brightening up an outdoor space for spring – their cheery yellow heads are the perfect additions for raised bed borders and even in hanging baskets. Daffodils are best planted in September but you can pick up plants ready to go and pop in your own garden. Pansies are a garden staple and quickly add vibrancy to any garden and come in a variety of colours. Hyacinths, with their pretty clustered purple flowers, are a good choice too. 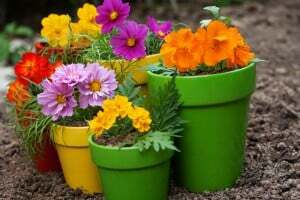 One of the easiest ways to brighten up your garden is to swap those old terracotta pots for brightly coloured ones. Alternatively, instead of transferring plants between holders, grab some paint and simply spruce up your planters that way. Stone paint works best for traditional pots but glazed and plastic versions might benefit better from textured spray paint such as Rustoleum – just be sure to protect your plants while you get crafty! If your garden furniture is looking a little tired, consider swapping it for some new models in vibrant colours. A bold blue dining set and a yellow bench will instantly brighten up the space and can be easily picked up from the local DIY store or, like the pots, you could transform furniture you already own with a lick of paint. There’s nothing paint can’t do when it comes to brightening up your garden. Take a pot of fuschia or sunset orange paint and apply this to your lonely looking garden shed in the corner or even on the brick wall that runs alongside your garden. It’s a simple way of instantly adding some colour and if you don’t like it next year you can just paint over it! Many of us fill spaces of our garden with gravel and usually end up purchasing dull stones that don’t really do much for the space. Choose purple or blue slate instead or green granite gravel and instantly brighten up those areas around the lawn. Cushions can even do the job for you, pick up some vibrant covers and use these when dining outside once the warmer weather arrives – Ikea’s Nästön range are a great option. Bench covers, parasols, swing love seat shades; these can all be enhanced with bold colour fabrics – either choose colours that match and fit a certain scheme or be brave and choose shades that clash. When it comes to brightening up your garden for spring, the little changes make all the difference. 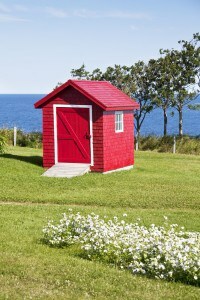 Try some of these this year and enjoy a pleasant, vibrant outdoor space.